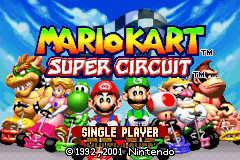 Mario Kart: Super Circuit is the third game in the Mario Kart series, the first to be released on a handheld system, and the first not to be developed by Nintendo EAD. The game uses a similar pseudo-3D engine to Super Mario Kart, but includes all of the characters and several items from Mario Kart 64, even sharing a number of sprites from it. In December 2011, it was released for the 3DS Virtual Console (with no difference aside from lack of multiplayer functionality), as part of the 3DS Ambassador Program. Tilemaps and minimaps exist for all four of the Battle Courses from Super Mario Kart. These could have been used as placeholders before the new ones were completed, or it may have been possible to unlock these courses just like the tracks at one point. Unlike all other tracks and battle courses in the game, which are stored in chunks, these are each stored in one piece, as in Super Mario Kart. All of them use Super Circuit's Battle Mode theme. They occupy track IDs 0x34 to 0x37. They can be played using the GameShark code 83003621 00XX. The minimap of SNES Battle Course 1. The minimap of SNES Battle Course 2. The minimap of SNES Battle Course 3. The minimap of SNES Battle Course 4. The minimap of Award Ceremony. This is the track seen during the Award Ceremony sequence after finishing a cup. It reuses the music and minimap from Peach Circuit; some sprites for the trees are also loaded but unused. The AI route was not programmed for other characters. Its ID slot is 0x1C. The slots 0x0 to 0x3 and 0x1D to 0x1F are not assigned any track. Trying to load them will crash the game. The Bob-omb icon may have been intended for when a player becomes one in Battle Mode, or for something similar to the Bob-omb item in Mario Kart: Double Dash!!. Along with the other used items, the Banana Bunch, Golden Mushroom, and Fake Item Box from Mario Kart 64 were also supposed to make a reappearance, but apparently weren't finished in time for the game's release. These items can be accessed using the item modifier GameShark code 83003D12 10XX, not including the Bob-omb. 0x6 Triple Banana Unfortunately, this does nothing when used. 0x9 Gold Mushroom Works perfectly fine; grants a bunch of boosts for a limited amount of time. No other items can be obtained while it's active. 0xD Fake Item Box Places a single banana peel behind the kart. 0xE Infinite Mushroom When Gold Mushroom is used the item gets transformed into this. Grants unlimited boosts and gets reset to 0 when the timer runs out. With the exception of Rainbow Road (which are identical to Mario Circuit's, save for a bad palette), each SNES track's graphic set includes a unique, revamped oil slick graphic, as well as an earlier version of the coin. Mario Circuits 2, 3, and 4 are the only Super Mario Kart tracks to use oil slicks, but they are not used in this game. The images above are in the following order: Mario Circuit, Donut Plains, Ghost Valley, Bowser Castle, Choco Island, Koopa Beach, and Vanilla Lake. Despite the removal of Monty Moles from Donut Plains 2 and 3, the holes they pop out of were still given a graphical update in the tracks' tileset. Most new graphics for new courses were used, but some were axed, and we get to see them here, in all their GBA ARM glory. Along with the tree, a pipe and mushroom can be found in Mario Circuit's sprite graphics. Pipes were a feature in several Super Mario Kart tracks, and a big Mushroom appeared in Mario Kart 64's Mario Raceway. Likewise, Fuzzies from Super Mario World 2: Yoshi's Island appear with Sky Garden's beanstalk graphics, implying these were intended to appear in the course at some point. Every track tileset in the game has an early version of the zipper and jump panel graphics, which are overwritten with different versions in-game. On the early version of the zippers, the arrows do not flash, and the arrow and yellow square are outlined. The shade of red used is darker in the final sprite. The jump panels lost a great deal of detail, partially due to the fact that darkest shade of yellow is overwritten with the flashing red color used on the final version of the zipper above. In the Japanese version, the Shy Guys in Sunset Wilds wear Native American war bonnets. These were removed in the international release, most likely out of sensitivity towards indigenous cultures. The Japanese version had online capabilities, which were done through connecting an adapter so that the GBA could hook up to a cell phone, presumably to allow ghost exchanging. The service was discontinued on December 14, 2002. Most of the preloaded Time Trial records were changed. The 1st Place times and best lap records are the same for all versions, but 2nd-5th Places are different. In the Japanese version, 2nd-4th have a slightly slower time from the 1st Place record and 5th Place is always set to 3'00"00; in the international versions, times are all 30 seconds apart from the 1st Place record. This page was last modified on 14 March 2018, at 12:02.